For The First Time, China Launches A Moon Rover Mission : The Two-Way The mission has become a reason for national pride in the country. If successful, China would join the U.S. and the former Soviet Union as the only countries to achieve a soft landing on the moon. The Long March-3B carrier rocket carrying China's Chang'e-3 lunar probe blasts off from the launch pad at Xichang Satellite Launch Center in southwest China's Sichuan Province on Monday. Early this morning, China successfully launched what it hopes will become its first rover mission on the moon, the official state news agency Xinhua reported. 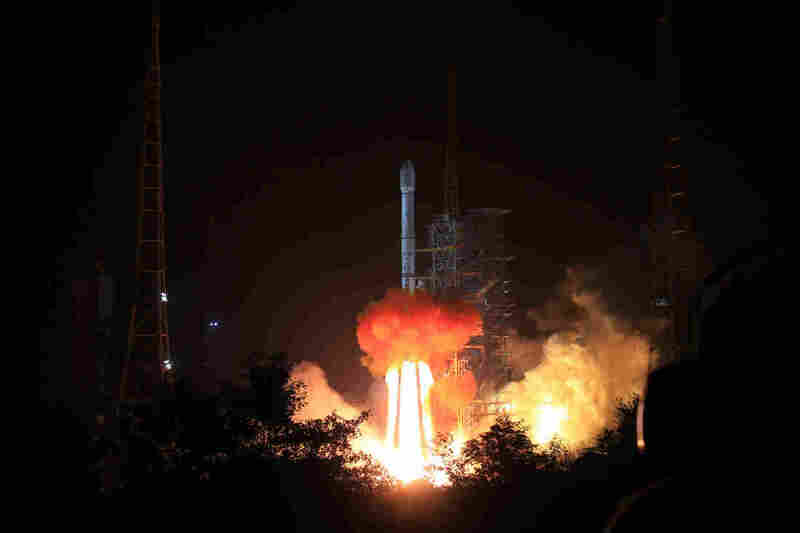 The Chang'e-3 lunar probe was launched atop an enhanced Long March-3B rocket and is intended to be the first "soft landing" on the moon since an unmanned Russian mission touched down in 1976. A soft landing means that the vehicle aboard the rocket, named Jade Rabbit, is expected to land on the surface of the moon in about two weeks and begin its exploration of an expanse of hardened lava on the Sinus Iridum crater. "While China's space achievements appear to imitate those of the USA and Soviet Union in decades past, they stir considerable pride and nationalism within China, whose government stresses its use of indigenous technology, and peaceful aims in space. Live TV broadcasts showed excited scenes at the launch center, where a reporter from the national broadcaster CCTV embraced one delighted designer. "Some viewers who stayed up to watch later went online to celebrate. "'The scientists are so great,' wrote an 'inspired and proud' Wang Wei on Sina Weibo, a Twitter-like micro-blog platform. 'Of course there's still a definite gap from America sending humans to the moon, but this is already amazing,' wrote Wang, an economics professor in east China's Shandong province." The New York Times focuses on the big picture. This mission, the paper reports, is not only an opportunity for patriotism, but it also tells us that China has made significant leaps in how it develops technology. And, of course, this could also have military implications. "If it's all successful, it will certainly indicate that they have really come up the learning curve in terms of technology," Joan Johnson-Freese, a professor of national security affairs at the United States Naval War College in Rhode Island, told the Times. "China's getting a lot of prestige, which turns into geostrategic influence, from the fact that they are the third country to have manned spaceflight capabilities, that they are going to the moon." The BBC reports that after this mission, the country plans to send another unmanned rover that will bring back moon samples. After that, China plans to send a manned mission to the moon. The BBC spoke to Ouyang Ziyuan, a scientist advising the mission, who said that aside from providing China an opportunity for intellectual and scientific development, perhaps one day China could exploit the moon for its resources. "The Moon is full of resources — mainly rare earth elements, titanium, and uranium, which the Earth is really short of, and these resources can be used without limitation," Ouyang told the network. "But it's unnecessary to get them now because it's very costly."